Rice flakes are known by several names such as Flaked rice, Beaten rice, Aval, Avalakki, Poha and Chiwda. Rice flakes are one of the many traditional products in India and are prepared from parboiled rice. The preparation goes as follows: paddy is soaked in water for 2-3 days to soften the kernel, followed by boiling in water for few minutes. After cooking, the water is drained off, and the paddy is heated in a shallow earthern vessel till the husks break open, after which it is pounded by a wooden pestle, which flattens the rice kernel and removes the husk. The flakes come in different thicknesses depending on the pressure used in the flattening process. Flaked rice is thin and papery and of white colour. It can be stored without deterioration for several months. The vitamin content is equal to that of parboiled rice and it is a nutritive product as no polishing is done on rice. Rice flakes are a good source of B complex vitamin niacin and the important mineral iron. Rice flakes are basically a breakfast food. Many preparations are made out of it by adding suitable flavouring and sweetening agents. It is suitable for preparing soft-cooked (bhath), toasted and seasoned mixture, tamarind bhath, upma, pongal etc. The flakes are able to absorb a large volume of liquid when used in various dishes so they absorb flavours well. 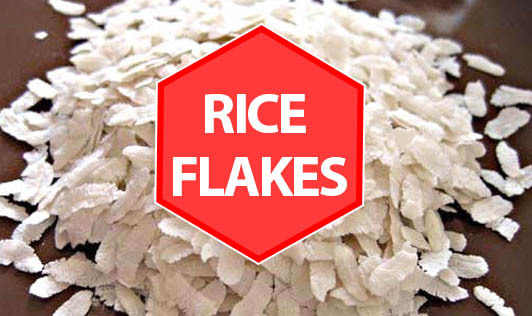 Rice flakes are also consumed as a snack after sautéing it with ground nut. They are very popular in Asian cooking, but in Western countries they are more often used commercially in the production of cereals and rice snacks.